The second Going Global report builds on the export intelligence provided in the first report, which focused on market access in North and South America. 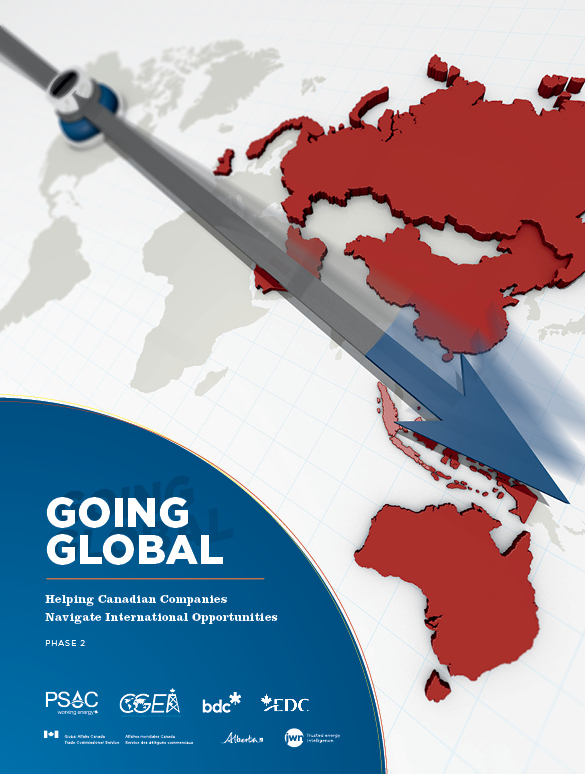 Going Global: Helping Canadian Companies Navigate International Opportunities researched export opportunities in 10 additional global markets: Australia, China, Indonesia, Iran, Norway, Qatar, Russia, Saudi Arabia, the United Arab Emirates and the United Kingdom. These two reports quantify which of the 16 countries offer the best market opportunity based on the size and maturity of its oil and gas production assets, and how well these assets match up with the Alberta industry's core competencies in: heavy oil development (onshore and offshore), unconventional resource development (tight oil and gas, coalbed methane), and enhanced oil recovery. The Going Global Phase 2 report will help prospective exporters to identify which markets best suit their companies based on market potential, core competencies and risk for tolerance. The report is complimentary and available for download. Take a quick survey and you could win $100 Visa gift card! We are looking for your insight on the oil and gas industry’s marketing initiatives in an effort to move forward with additional industry intelligence reports and export market offerings. Please take a minute and complete this short survey. Upon completion, you will be entered into a draw for a $100 prepaid VISA gift card. Survey closes on Friday, April 14, 2017.